Located in downtown Salt Lake City, the historic McCune Mansion provides an elegant and exceptional venue for weddings and receptions. 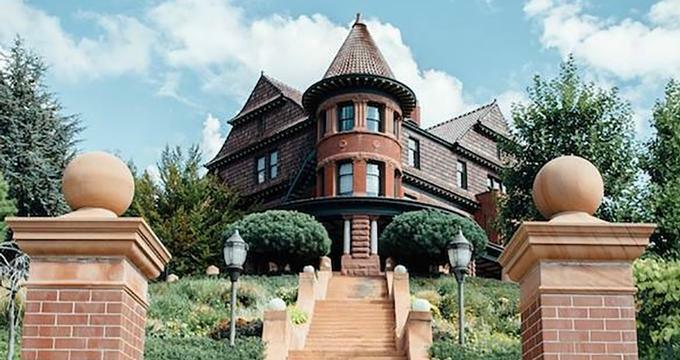 Set within a Shingle-style mansion dating back to 1901, the unique site and landmark treasure boast original architectural splendor and exemplary artistry with Utah sandstone trimmings and red roof tiles, making it one of the grandest of early 20th century homes in all America. Built-in 1901 by railroad tycoon Alfred W. McCune, designed by prominent architect S.C. Dallas, and beautifully maintained throughout the years, the McCune Mansion boasts noteworthy interior details and is filled with antique décor and furnishings, objects d’art, Nubian and Irish marble, original Russian impressionist paintings, and exquisite French tapestries. Today, the mansion offers a spectacular setting for weddings, anniversaries, and other celebrations. The McCune Mansion is home to several rooms that can be used for intimate ceremonies, grand receptions, and unforgettable wedding photographs. The mansion can be hired as a whole entity, with access to all the rooms, or in sections for smaller events and functions. The McCune Mansion's main floor features a grand entrance and reception foyer, a central hall and a dining room, a small sitting room and a tea room, a huge drawing room and a bar-gallery, the larger of which can accommodate seated dinners, receptions and banquets. The second floor of the McCune Mansion features a central hallway, the Alfred and Elizabeth McCune rooms, and an Executive Boardroom with complimentary wireless access and state-of-the-art audiovisual technologies. The third floor of the mansion features two spectacular ballrooms and a Hunting Room, which are perfect for elegant receptions and grand gala balls. Boasting high ceilings with crystal chandeliers, soft lighting, and excellent acoustics, these rooms have cozy alcoves and nooks for intimate conversations and sizeable wooden dance floors for dancing the night away. The McCune Mansion is surrounded by beautifully manicured gardens and grounds which are ideal for outdoor ceremonies, picnics or cocktail parties in tranquil and soothing settings. Amenities and services offered with the rental of the venue include the use of the site for wedding ceremonies and receptions, customized event planning services with a professional wedding planner and manager, the use of a beautifully appointed bridal suite and groom’s room for getting ready, and on-site catering and beverage services. Tables, chairs, linens, and complimentary valet parking on the property are also offered. The McCune Mansion uses award-winning on-site caterers for culinary and beverage services with customized and tailor-made menus for all budgets. A variety of choices are available such as butler-passed hors-d'oeuvres, buffet station-style dinners, plated dinners, and cocktail plates, and dessert stations. Full-service bar services are also available, with options ranging from open and honesty bars to butler-serviced stations. The McCune Mansion is located at 200 North Main Street in Salt Lake City, is wheelchair accessible, and offers complimentary valet parking on the property.